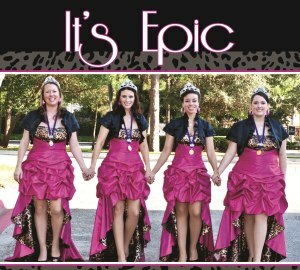 Shortly after being named 2012 Harmony Queens, the members of Epic were handed a comprehensive guide produced by the Association of Harmony Queens, Harmony, Inc.’s organization of past quartet champions. Now, we have to explain something to you. We weren’t totally prepared to be Queens, and we’re still pretty goofy and giddy about the fact that we even have an AHQ handbook in our collective possession! We do have a former Queen in our ranks, but when Kris won with Hot Topic in 2003, she was in college and her main job was to show up in the right outfit and sing the part nobody else wanted to sing! So even with Kris’s patient guidance for the rest of the newbie Epics, we knew we’d probably stumble through our reigning year–with or without a manual to help us out. Before we even boarded a plane to head back to Virginia after we won, we joked that we’d probably go down in Harmony, Inc., history as the Queen quartet that broke the most rules in the Queen Book. As it turns out, the AHQ manual is more administrative in nature, and really does provide a great map of what role we’ll play at International Contest & Convention this year. But the idea of Epic breaking the rules in a not-entirely-real “Queen Book” is just too funny (for us anyway) to let go! “I’m smiling because one of the perks of Queendom is that you no longer have to register each year. I will send out a message asking if I need to update anything, or you can just let me know. That’s it! You ladies are such a joy to work with – anticipating everything, even things you don’t need to do. Bless you! Well, there you go. Lucky for us, there are very sweet and patient Harmony veterans who will help us each time we break a rule in the Queen Book :-). 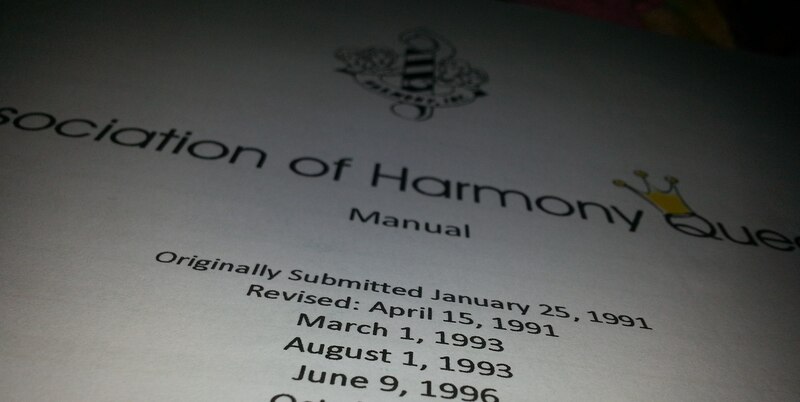 We also lean heavily on our sisters in Foreign Exchange, 2011 Harmony Queens–we’ve already pestered them about what songs we’re supposed to be learning for November. Hopefully with Foreign Exchange and others in-the-know keeping an eye on us, we’ll keep our rule breaking to a minimum! Of course, Anne Albright IS in this quartet… so we might be toast no matter how many watchful eyes attempt to keep us on track!!! Just love it! I’m sure you’re not the first (or the last) ladies!